This box and its various compartments held all the implements and ingredients required for the hospitable gesture of preparing and offering the betel nut concoction popular in many Southeast Asian countries. The box is skilfully inlaid with mother-of-pearl, which has been expertly shaped to fully exploit the glowing tones of opalescent pink and blue-green that can be elicited from the shell by a careful artisan. 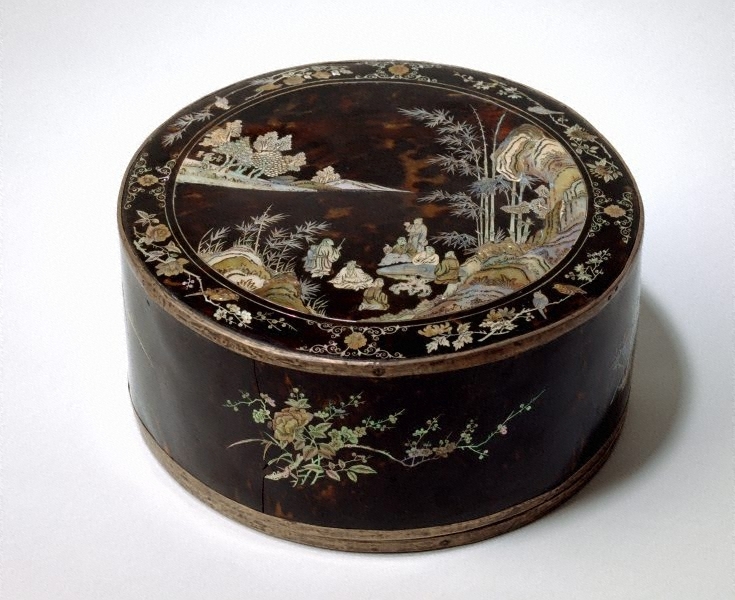 The scene on the cover, as well as the floral sprays around the sides, are Chinese in taste, and the piece could well have been made for use within the imperial court at Hue, the 19th century capital of the last royal dynasty in Vietnam, the Nguyen dynasty (1802-1945). The Asian Collections, AGNSW, 2003, pg.304. 11.0 cm; 24.5 cm diam.